The picture which you see below was found among very old family pictures. Among my ancestors were some who lived in Grayson County, Virginia. 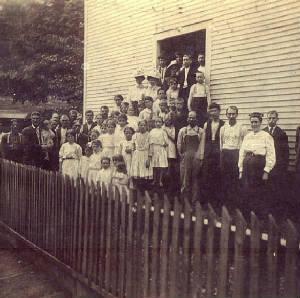 The picture below was marked "Elk Creek School." The picture below reminds me of a picture which I found in a book of Elk Creek Academy (1887 - 1909) in Grayson County, Virginia. See Bicentennial Heritage: Grayson County, Virginia 1793 by 1908 Courthouse Foundation, Independence, Virginia (1995)at page 72. The original smaller building of the Academy was a white, narrow 2-story building which looks very much to me like the building in this picture. Some older photos can be identified as to age by looking at the hairstyles and clothing of the period. Compare these to those in photos on which you do have a date, or look for articles on photo dating in genealogy magazines. If you have taken family pictures, have you remembered to mark them with the names of people in the picture, and when and where they were taken? This is so helpful to preserving family memories! Photographs taken in the 1800s often reflect the photo technology of that era. Perhaps an experienced photographer might be able to talk with you about this, and tell you how to recognize one of these early pictures.